Sometimes a sewing project just shouts to be made. 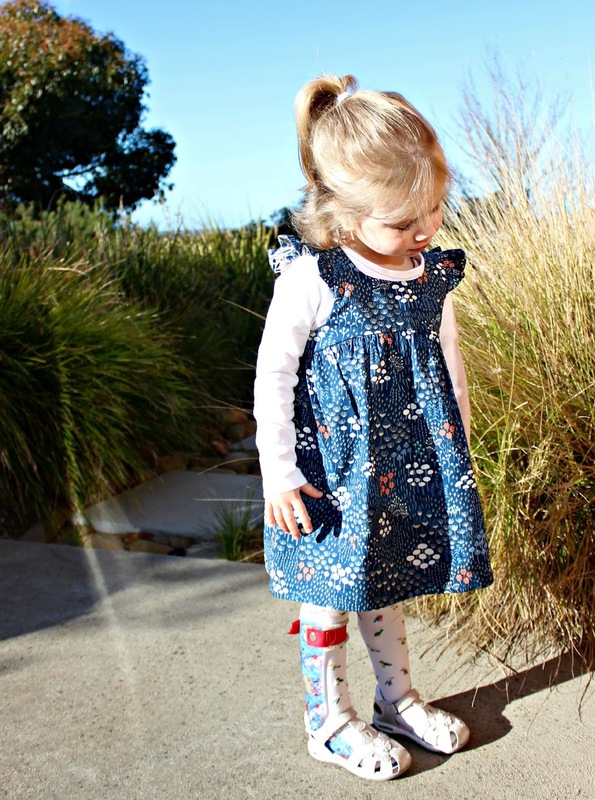 This is the Bohemian Babydoll dress by Elegance and Elephants. I made a couple last year and have been meaning to make more for ages. It's a quick, easy sew with no closures but it's great for everyday wear. I used up some of my cloud9 wildwood stash. I bought heaps of this a while back and was never quite sure what to make as I liked it so much. Then the idea of this dress came with the white colourway as the flutter sleeve lining and hem facing. I love that little bit of contrast. I surprised myself again with going for the flutter sleeve. I think I really am a convert to that design feature now. Although the weather is still cold here, this dress really layers well and yet I'm sure it will be great in Summer too. Freya was just so excited to be outside, there was no stopping her stomping around the garden. I also have enough of this fabric to make something for myself, I just haven't decided what yet! Little Miss seems to like it too. She told her Dad this morning that it was what she wanted to wear to Childcare. What a perfect fabric for this pattern. I also adore the wildwood range - so beautiful. I've still got more left, just need to actually make stuff with it instead of keeping it because it's just so pretty!